Two overlapping theories of the application of psychotherapy in the treatment of BPD have recently emerged. (REFs 31,33). 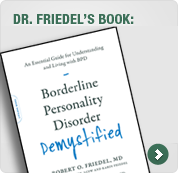 Though different in one significant respect, the general approach proposed by these authors is that more attention needs to be made to the common strategies of the BPD-specific psychotherapies, because they have not demonstrated clear differences in outcomes.